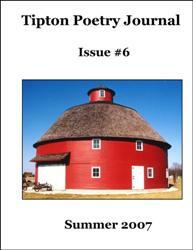 My poem, Jake, the Barber, is in the October 2007 issue of Flutter Poetry Journal. 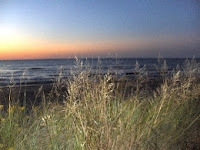 Lake Michigan at sunset (near Beverly Shores, Indiana). I read at an open mic at Doc's Music Hall in Muncie, Indiana last Thursday night. The open mic, hosted by Desiree, is weekly on Thursday nights from 8pm-10pm. Just before the rock bands come on. The best part of the venue is that Doc usually plays keyboards behind the poets. 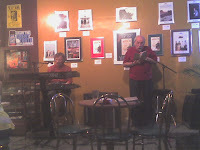 Here is a photo of Richard Plfum reading at Doc's. Saint Joseph's College will be hosting the first annual A Writer's Gathering 2007 on Saturday, September 22, 2007 in Rensselaer, Indiana in cooperation with Prairie Writer's Guild. This is billed as a day of inspirational speakers, writing workshops and the opportunity to network with fellow writers from around the state. Susan Neville, who teaches writing at Butler University and is the author of Sailing the Inland Sea: On Writing, Literature, and Land, will be the keynote speaker. Costs are $50 for the full-day gathering, meals and snacks. All sessions will be held in the Core Building. Take the main entrance to the curve to the right. Parking lot will be on your left. Sandy Sue Benitez, Ben Berman, Sam Byfield, Carol Carpenter, Dan Carpenter, David Cazden, Antonia Clark, Mark Comstock, Jack Conway, K.R. Copeland, David Allan Evans, Gail Gilliland, Ernestine Hayes, Paul Hostovsky, Joshua D. Kalscheur, Nita Karpf, Norbert Krapf, Jody Kuchar, Sarah Layden, Rohana McCormack, Beth Mink, Cheryl Soden Moreland, Michelle Morgan, Kristine Ong Muslim, Thomas Alan Orr, James Owens, Jeffrey Owen Pearson, Richard Pflum, Donald Platt, Priscilla Rhoades, Maureen A. Sherbondy, Cheryl Snell, Paul Sohar, Michael E. Strosahl, Ray Succre,David Thornbrugh, Laura A. Walker, Yun Wang and Alessio Zanelli. I will be among those poets reading this Thursday night at the Poetry in the Gallery event at the Indianapolis Museum of Art. Local poets will read their poems inspired by suburban surrealism and the art of Emily Kennerk in the Forefront galleries. This event is copresented with the Writers Center of Indiana. Carpenter, David Cazden, Antonia Clark, Mark Comstock, Jack Conway, K.R. Pearson, Richard Pflum, Donald Platt, Priscilla Rhoades, Maureen A.
David Thornbrugh, Laura A. Walker, Yun Wang and Alessio Zanelli. 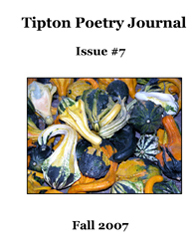 Yellow Thunder Walking has been accepted by The Hiss Quarterly in the "Collateral Indigeny" issue, which will be published in August. I will be reading poetry at the Indianapolis Artsgarden in the (Circle Centre Mall) on Monday, April 30, 2007 from 12:15 pm - 1:15 pm. I will be one of 3 poets reading as part of a weekly series of readings for National Poetry Month organized by Indiana's Poet Laureate, Joyce Brinkman. The other poets at the reading will be Phoenix Cole and Tasha Jones, both from Indianapolis.